….this is not as in “Leaving Las Vegas” – but it’s what we do – as NON-REV’s to get from A – to – B. This will be of interest to anyone that works for an airline and travels for fun and misery 🙂 and maybe interesting to all those other “normal passengers” who just BUY their tickets!! 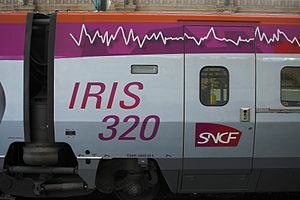 1)25 Oct 2012 – Book TGV travel from Marseille to Paris. Great fare! Only 153 euros for both of us to Paris by this fast train – and first class – and senior rates – whoo hooo. Drive car into Marseille into thick rush hour traffic and park at St Charles Gare (train station) to print tkts. Told twice to go to certain location thru double doors, down stairs, to some “cafe” to print. It doesn’t exist. Stand in line with other strike victims (trains on strike) and find out that we cannot print tkts till 20 minutes before the TGV leaves the station. That is too anxiety ridden for me, we need to know for sure that they will take the conf #………and we think it won’t work most likely. On-line tickets at huge discount have always been a problem with the SNCF. Drive back home. Think about what to do. Drink. Hear from David’s boss that he doesn’t have to teach Sat – so we can leave early now. Despite the fact that it’s zero seats on flights, AirFrance still has strike issues, (mais, the trains have settled their strike issues), BUT there is a FRANKINSTORM approaching the eastern seaboard……. (only where USAIRWAYS flts come in, ofcourse, ) and , our AirFrance tkts are to JFK, so that’s a no-go. We will now try ZED fare to Canada and/or Chicago out of AMS. parked at British Council, took bus and then metro to St Charles Gare, (Marseille Train station.) We only have small 22’s (rollerbags) with us. No line that early in morning! Great! Discover that TGV to AMS – out of sight tres cher……so nix that. Have “cafe creme” and croissant at McDonald’s, get on MAC to look at options, – find that airfare from Marseille to Paris is also over the top – forget that – back to tkt office. Buy one way to Paris, 82 euros each, senior fare on TGV, First class only 10 euros more. Eureka! WONDERFUL smooth ride and fast through the early morning countryside of France – mist and huge soft clouds hovering low adding a mythical quality to our experience. We will need to draw on that image – in the long hours ahead. Head over to metro – to Gare du Nord, our home away from home the last 10 months of living in Paris……..take the RER B all the way to Charles de Gualle Aeroporte! USAIRWAYS ticket counter CLOSED (10 min prior to our arrival) ! Take a deep breath and head over to – VOILA – the new bathrooms. This is fun – as we have not seen improvements in CDG in over 15 years. This makes us happy. I cannot get RID of these stupid numbers on the left – sorry about that………. This is our next plan of action…….7AM to the USAirways ticket agent at the CDG Terminal One – location – (and they do say to us non-revs “never expect to get your ZED fare AFTER the flight has left at 12Noon – as we go home”. So remember that non-revs – you want a ZED fare – go to the airport super early – before the pax even are in line for the 10 + AM flight……. DAVID JUST INFORMED ME – via his iPOD- that it is THIS WEEKEND that the WORLD SERIES is being played – Game 3 – and guess where ???? DETROIT !!!!!!!! Oh Mon Dieu. WEATHER – and WHETHER you’re the adaptable type – or not so much…. We received a free night at the hotel called “B&B” – in the ROISSY area next to CDG aeroport. We did recover ALL of our things and that whole story is in another blog. It was a horrible experience, but we were very lucky. Since we had not had a chance to return to this wonderful little “B&B Hotel” in Roissy for a year now. When we approached the clerk at the hotel he said that our voucher had EXPIRED. David explained that the manager of the B&B had come to the hotel during our crisis and said that he had to put a “date” on this voucher, but that we could use it ANYTIME. That didn’t do a bit of good with the person standing before us, and he honestly couldn’t do a thing without a manager’s approval. The manager was “out”. It ‘s a weekend ! Ofcourse he’s not here. The nice man, our hotel clerk, clicks more on his “ordinateur” and we continue to wait….to see if it will magically accept the number on the voucher . David continues his saga of …..”and my therapist said that I should go back to the place where I have had my recurring nightmares, to get over this ……” I just roll my eyes. Needless to say, we decided to go to another hotel (there are beaucoup hotels in this Roissy – Charles de Gualle area) and basically, I recommend this area. ** (See my blog above on this report), but be ever vigilant, when you have expensive electronics, find a hotel with a SAFE, or, hide all of your electronics if you go out of the room for any reason. Better yet, take them in a backpack where ever you go, if there is no safe. That’s our suggestion, and that is now what we do. I prefer the safe in the room, but we cannot always get a hotel with a safe. Paris time. If not, we have the ZED to JFK, which in no way do we want to really try, but since it’s our only other ALTERNATIVE today, (if DTW doesn’t work out) then – we try it. My fear is getting stuck with the “FRANKINSTORM – Hurricane – whatever hitting the EASTCOAST. That’s where we are presently. We cannot believe the other weather conditions hitting the border areas between Germany, Switzerland and France (heavy snows) and that this is vacation time for French people and everyone seems to be getting some sort of surprise in their vacation plans. Those heading to the south of France to escape COLD PARIS and Northern areas, are coming into heavy winds and rain. Those not planning to SKI in OCTOBER, actually could now, and those trying to get to the East Coast of the United States will be arriving during this “catastrophic storm” as the US meteorologists are calling it, and those going to Western Canada are hit with a 7.7 earthquake off British Columbia, and those heading to Hawaii are expecting a SUNAMI because of the earthquake. Holy Moly!!!! ** It’s 10 euros one way to get into Paris from here, if you have a day or a stopover, so it’s not cheap transportation wise, however there are buses, and they are slow, but inexpensive. Thanks for keeping in touch with this blog………..we will update as WiFi is available. Yes, I feel your pain!